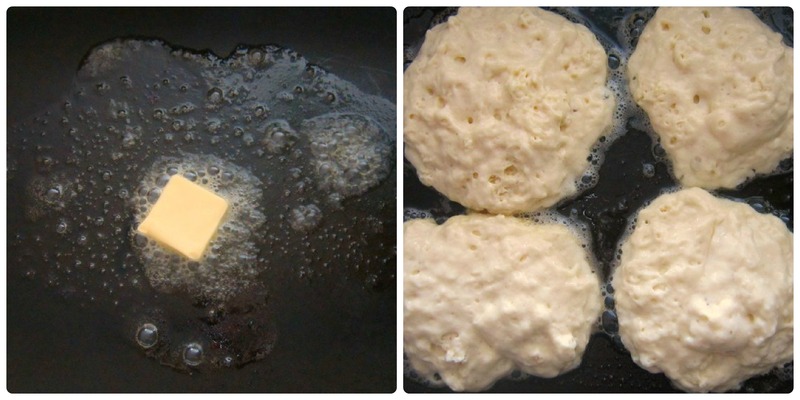 This is one of the things in our morning routine before school…making HOMEMADE Buttermilk Pankcakes. Yes, almost every morning…for the past 6 years! My little East will eat a (shorter) stack for breakfast and even some as a bedtime snack. 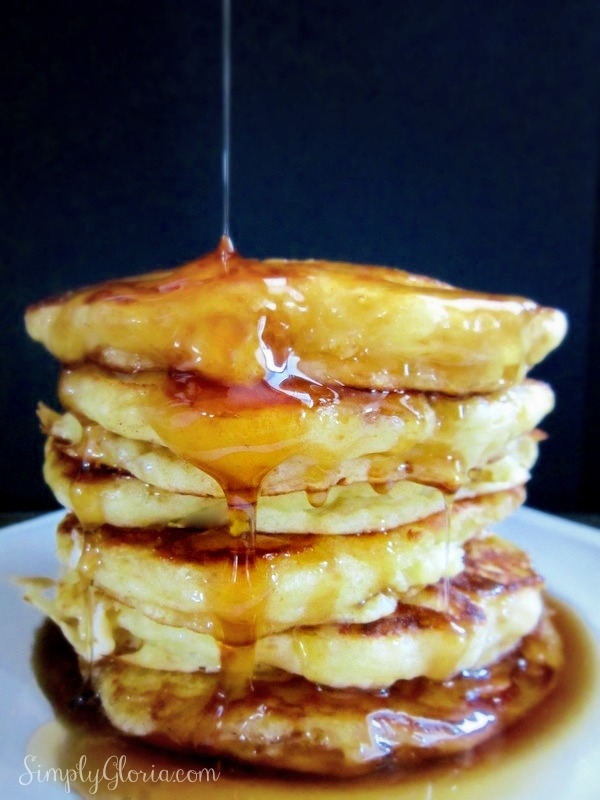 So, diving into a stack of homemade buttermilk pancakes drowning in syrup in the morning or evening…maybe you’re a “syrup dipper” like me… But making them at home only takes a few minutes! Besides, you can freeze them individually. Then pop these babies in the micro to heat up within 30 seconds and devour! There’s only a few EASY steps to making the fluffiest buttermilk pancakes in your home. 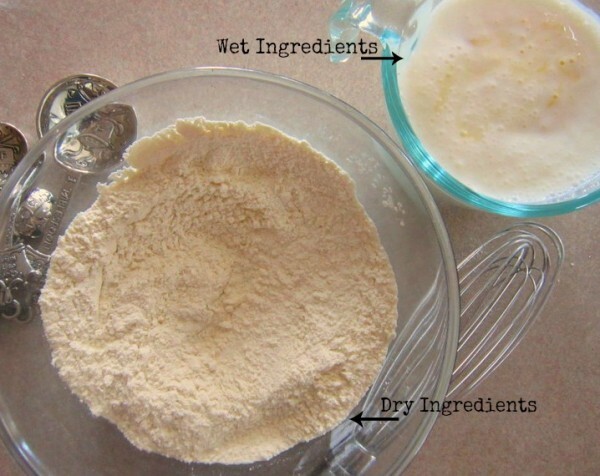 First, whisk all the dry ingredients together–flour, sugar, baking powder, baking soda and salt. In a separate bowl, beat one egg into the buttermilk with the vanilla. Set the batter aside for a few minutes while you start to heat up your skillet or frying pan. Set your pan on medium-high heat. Add about 1 tablespoon of butter to your heated pan. If your butter immediately starts turning brown, your pan is too hot. Wipe it out and do another dab of butter. Then it’s time to add your pancake batter. The arrows show when it is getting ready to do some flip action. You’ll start to see little air bubbles pop…the more air bubbles you see, then you’ll know it’s time to flip. Although if you’re a peeker, gently lift a tiny side with your spatula and see if it is golden brown. When ready–FLIP! Cook the other side for another 2 minutes. And Whola! You’ve just made some pillow-y, soft, fluffy pancakes! And not to mention…all from scratch! What is your favorite topping to put on some homemade buttermilk pancakes? This recipe makes 6 medium sized pancakes. So you can go BIG or go small! This recipe is easily doubled. If you’d like to freeze some for later, let the pancakes cool. Then wrap them in an air tight feezer-type wrap, individually. 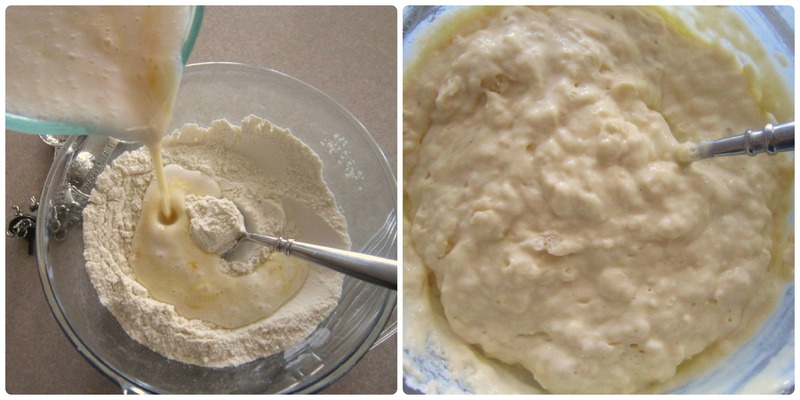 Whisk together the flour, sugar, baking powder, baking soda and soda. Beat the egg into the buttermilk with the vanilla. Gently stir with a large spoon. Add 1 tablespoon of butter to the heated surface. Add ¼ cup of batter (per pancake). Allow to cook for about 2 minutes. 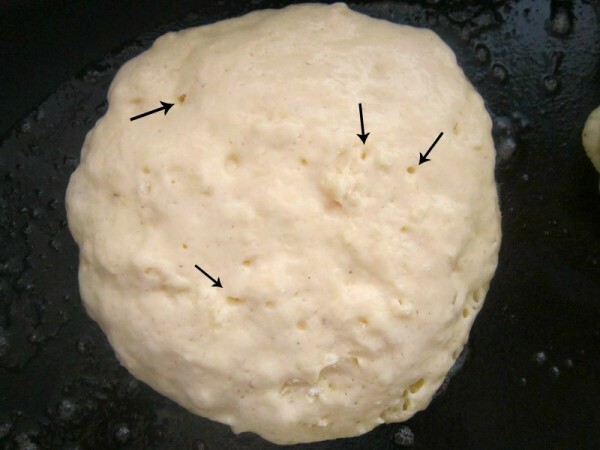 Flip pancake when you see air bubbles and when the edges are dry. Cook the other side for 2 minutes, as well. 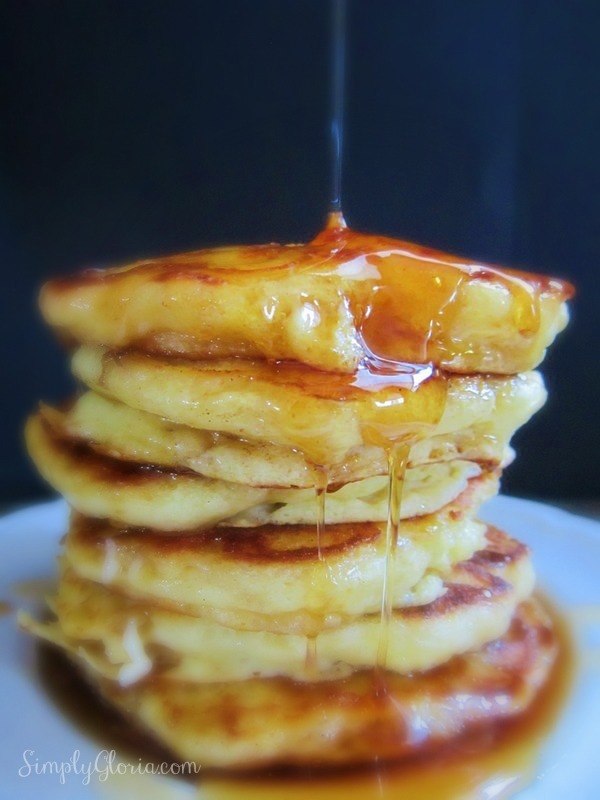 Now you have fluffy homemade pancakes! MAKES 6 medium sized pancakes. Can be easily doubled. To freeze: Wrap in air tight freezer wrap, individually. Amy @ Fun With Family and Fitness recently posted…What? They say fighting IS good for relationships! Pure maple syrup is truly the best! Thanks, Amy! I bet your sweet Courtney would love these! Mmm these look so soft and puffy! I love it!I think I need some pancakes in my life! 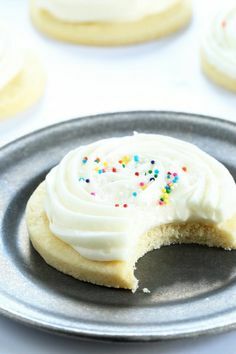 These look so light and fluffy! I absolutely love that top photo … commence drooling! a perfect homemade buttermilk pancake. fluffy, gorgeous, and soft! I’ve been searching for a “go-to” buttermilk pancake recipe just like this Gloria! I don’t make pancakes often but I need to start! sally @ sallys baking addiction recently posted…Super Moist Carrot Cake. It truly is a “go-to” pancake recipe! Sally, don’t you find out that buttermilk is like (one) of those magical ingredients, even in baking? It just makes these pancakes so moist and fluffy. It’s one of my “must-haves” delivered by my milk man every week! Thanks, Sally! I’m posting a buttermilk pancake recipe…tomorrow! What are the odds! Yours are stunning, Gloria! Pinning! I love how soft, fluffy, and beautiful they look! And your step by step pics are so helpful! Gloria, my favorite topping for pancakes is powdered sugar, sprinkled with lemon juice. My Australian born mother said this is how her mother always served them. Oh how delicious with the powdered sugar and lemon juice…what a great idea! I’d definitely love it! Sharron, thank you for coming over to leave such a sweet comment! Have a great rest of the day!